Thomas Chalmers (17 March 1780 – 31 May 1847), was a Scottish minister, professor of theology, political economist, and a leader of the Church of Scotland and of the Free Church of Scotland. He has been called "Scotland's greatest nineteenth-century churchman". 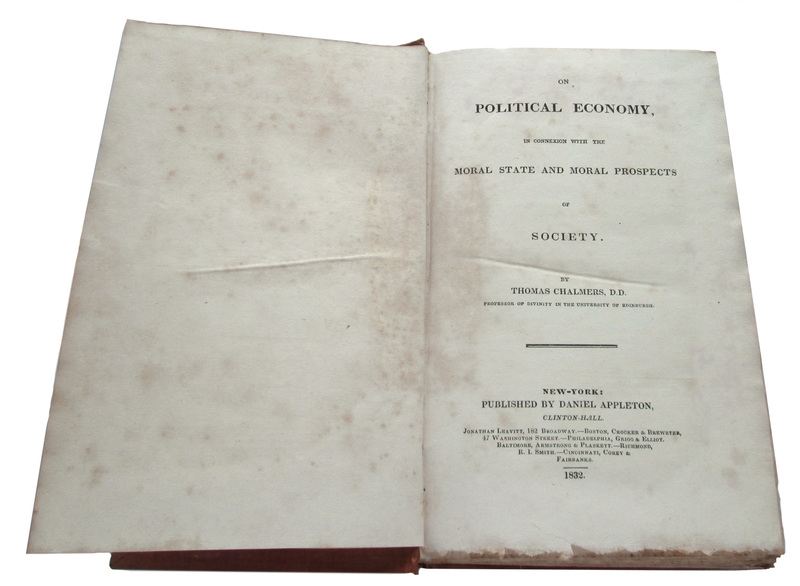 In this treatise, in which Chalmers follows Adam Smith and Malthus rather than Ricardo, the aim is not to develop a new treatise of political economy but through existing doctrines secure the moral, and thereby economic, elevation of society. (His practical applications amongst the poor of Glasgow worked successfully for over twenty years). He was acknowledged by contemporaries: McCulloch, the disciple of Ricardo, criticised him: Malthus, with whom he pursued a somewhat one-sided correspondence, acknowledged the pleasure and instruction of his writings. Schumpeter considered this work 'a book of considerable importance, but not easy to appraise. It represents a curious mixture of sound insights and technical shortcomings.' 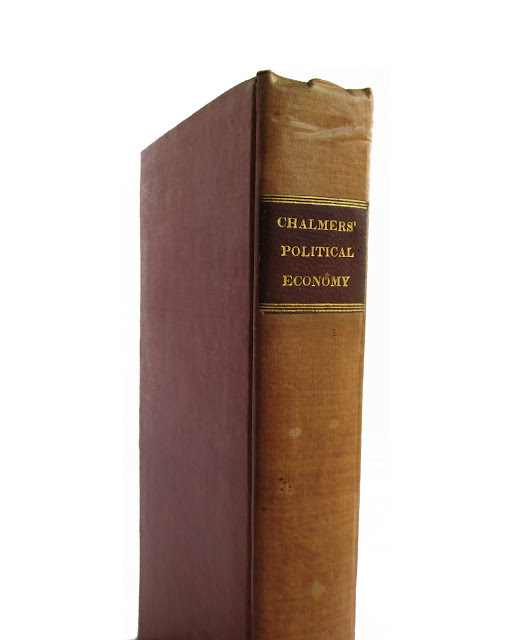 It is worth observing that Chalmers begins his Preface with a challenging definition of political economy, and why churchmen should be both interested and involved. 'There is one general application', he writes, 'that might be made of the whole subject, and which gives it, in our judgment, its principal claim on the earnest and respectful attention of a Christian philanthropist. Political economy aims at the diffusion of sufficiency and comfort throughout the mass of the population, by a multiplication or enlargement of the outward means and materials of human enjoyment. Now, we hold it to be demonstrable, on its own principles, that, vary its devices and expedients as it may, this is an object which it never can secure, apart from a virtuous and educated peasantry'. This edition is bound in reddish cloth boards, with gilt lettering on a brown leather spine label. Some mild stains to cover, ink spots on foredge; inner pages wavy and faintly tanned with foxing, faded and spotted spine. 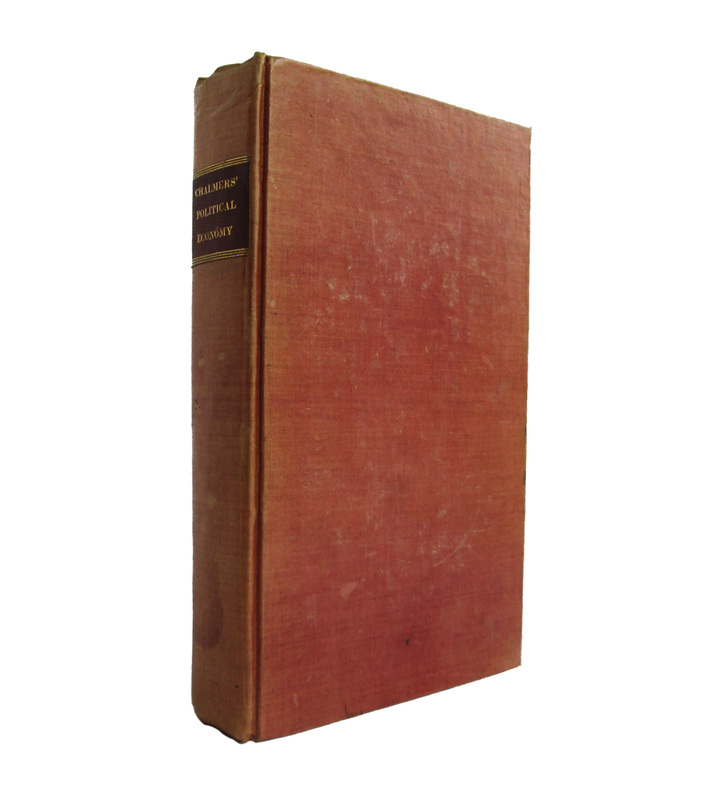 A scarce copy, most available antiquarian editions are from the British printing. 405 pages; approx. 4"x6"